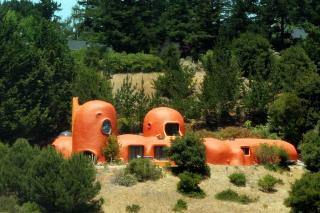 (Newser) – California's Flintstone House is on the verge of becoming much less Flintstone-esque. The colorful house in the shape of boulders has irritated neighbors in Hillsborough for years. But attorneys for the town have now filed a lawsuit, painting the owner's latest additions as the last straw, reports the San Francisco Chronicle. Since purchasing the property for $2.8 million in 2017, media mogul Florence Fang has erected a sign reading "Yabba Dabba Doo" and added a statued menagerie of prehistoric animals, including dinosaurs up to 15 feet tall. That the property perched on a hillside above Interstate 280 is now a "highly visible eyesore" is just part of the town's problem, per the Los Angeles Times. Arguing that the proper permits weren't obtained, attorneys say the property is also a hazard to visitors. They don't want to turn the place to rubble, but say Fang's decorations must go. SO glad I live where could put up whatever I wanted and no one could do anything. So many commies in America hating on free expression, don’t like the view, turn around. Fred: WILMA!! I need a Bedrock Lawyer Asap.